The folklore and beliefs of the different cultures and minority groups of Asia have always fascinated me and I am continually discovering new and amazing beliefs that have permeated their cultures for centuries and centuries, especially when it comes to textiles. One of the loveliest of these beliefs centres around the wearing of hats and caps by children. I've collected quiet a few over the years and I'm always drawn to them when hunting through antique and textile clothing shops when I travel. In the Hmong and many other cultures in Vietnam and parts of Asia, there is a belief that every one is born with a life-soul which is necessary for health and happiness in life. This soul however can become separated from the body and this leads to ill-health, bad luck or even death. Its believed that the the life-soul of a newborn baby is particularly vulnerable and is open to all sorts of misadventures. It may be drawn away by bright colors or sweet smells and sounds, or it might just leave if a baby is sad or unloved, alternatively it can be frightened off by a sudden loud noise or simply stolen by a bad spirit because its so small and beautiful. 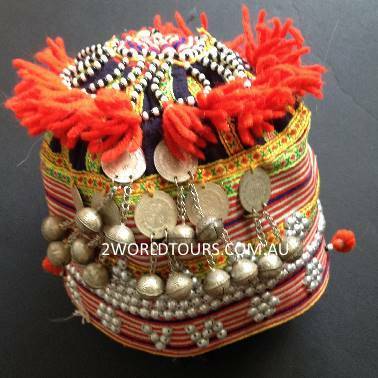 Traditionally children in the Hmong and Dao cultures of Vietnam wear different types of hats from when they are babies up to their early teens which are decorated with symbols and motifs. As a baby and a small child the hats are believed to disguise it as a flower so that the evil spirits looking down from above are tricked into thinking it is actually a flower and will leave it alone. 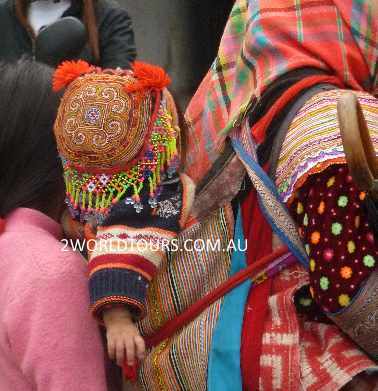 Some also believe that it helps protect the child's spirit escaping through its head or that their colourful hats will encourage the flower spirits to descend and inhabit the child itself (in fact in some Hong dialects the word flower and young child have the same meaning). 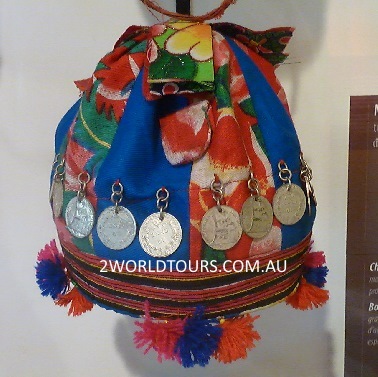 As a child grows older the hat tends to adorned with different symbols which although ward off evil spirits tend to represent good luck. Its not uncommon to see young adolescents still wearing caps in many of the traditional minority villages as their mums endeavor to protect them from sickness and give them a helping hand at school by adorning their caps with good luck motifs. 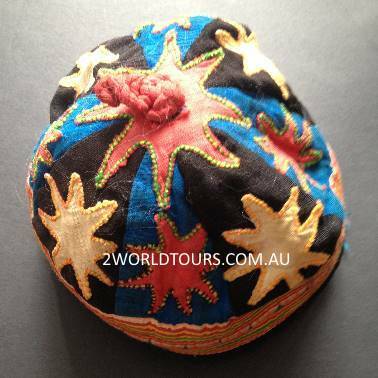 Typically a child's hat has a dark fabric base shaped into a basic skullcap. This is covered with colourful embellishments of varying types including cross stitches, applique and sewn on coins or beads.